That quote always makes me smile. 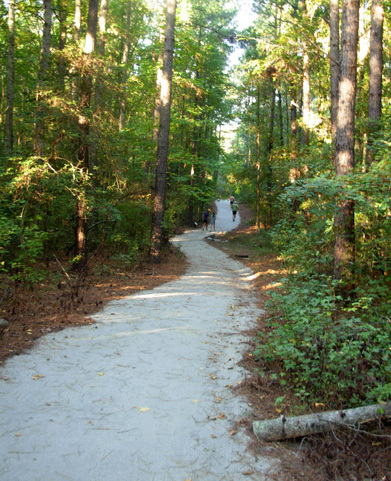 I was reminded of it recently when we checked out the great dirt trails through the woods at the new Falling Creek Park near Bedford, Virginia, our county seat. There are about a dozen exercise stations like the ones shown below that are built around a paved, handicapped-accessible loop. In addition to diagrams and instructions for various stretches and strengthening exercises, each kiosk has several quotes like the one above to make people chuckle and/or think. I'm wired to be one of those mostly optimistic, "glass half full" types. I tease Jim about being a "glass half empty" kind of guy sometimes, but he's usually optimistic, especially regarding our own life and goals. 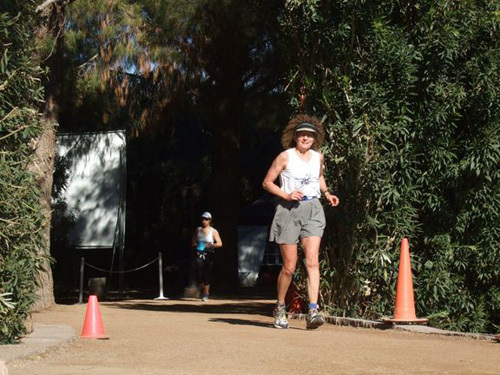 I think you pretty much have to be an optimist, or at least have a good amount of self-confidence, to be an ultra runner and tackle some of the things we do. Hopefully, our positive attitude is more of an inspiration than an annoyance to others! Jim and I always have some sort of running goals in mind for the next few months or year(s). As you've seen, they don't always pan out, but the important thing to us is to HAVE goals toward which to work. We need to continually challenge ourselves, and future races make the everyday training go a little easier. Even though we're passionate about running, training toward a race gets us out the door faster than training simply to stay healthy. We have some pride, after all. Races are excellent motivators for us to stay in shape and remain as "competitive" as possible for as long as possible. So now what, with no Bighorn or Leadville or other goal ultra race planned this summer?? Our carrot at the end of the stick is the Across the Years (ATY) 24-hour Run in late December. We really enjoyed that race several months ago and hope to get into it again this year. If we don't get in, we'll have to regroup and make other plans. We won't know that until the entry list is made public later this summer. We're optimistic about our chances, though, so our current plan is a build-up to a peak at ATY in six months. 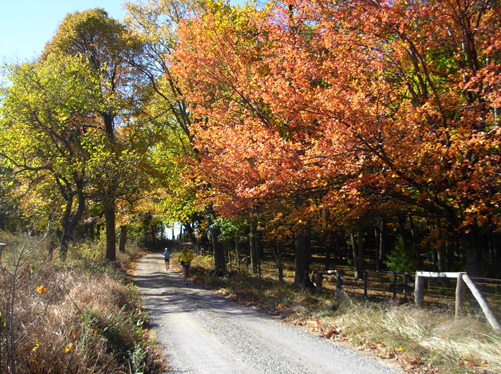 At this point, Jim is registered for the Hinson Lake 24-hour run in North Carolina at the end of September and Mountain Masochist (MMTR) 50++++ miles in early November. He'll probably run and walk the entire 24 hours at Hinson Lake this time, accumulating as many miles as possible to toughen his feet, brain, and other body systems. Last year he ran 50 miles and stopped because of foot pain. He doesn't know yet if he'll launch an all-out assault for miles at Hinson Lake or use it as a training run again. I've stuck to my plan of not running any ultras this year until Hinson Lake, which I've also entered. My current thinking is to run about 50 miles, volunteer several hours during the night, then see if I feel like doing any more miles around the lake before the 24 hours are up. I have a limited (but unknown) number of miles left in these Granny knees, and I don't want to use them up too quickly. It's more important for me to get major miles at Across the Years three months later, so Hinson Lake will be a long training run to build up my endurance and practice run-walk strategies for ATY. And there's another reason not to trash myself at Hinson Lake: I recently signed up for the inaugural New River Trail 50K two weeks after Hinson Lake. 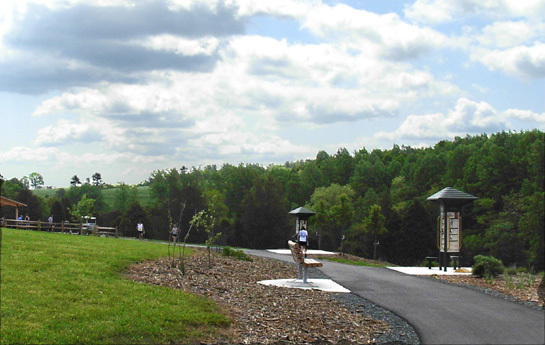 It will cover part of the main New River Trail (NRT) in southern Virginia and a spur trail to/from the village of Fries. 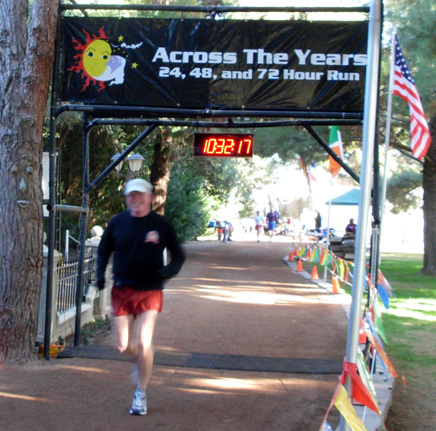 It's the perfect course for me as long as I train for the 13:27 pace I'll need to run to beat the 7-hour time limit. Jim and I have run at the northern end of the 57-mile trail twice (it's a couple hours from our home) but not this more southerly section. 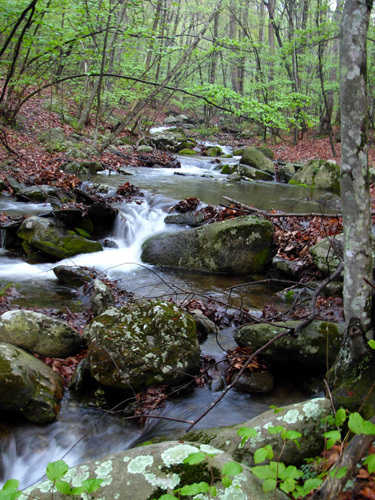 The race follows part of the New River and a tributary, Chestnut Creek, on an out-and-back course. Since the trail is built on an old railway bed, it's fairly flat. It's also fairly smooth dirt/crushed rock, which reduces my chance of falling. I go pretty slowly now over rocks and roots because I know how long it takes a 59-year-old body to heal from an injury. On a path like this, or Hinson Lake, I can run with more abandon (it's all relative, remember) than on a more gnarly trail. It should be fun! In mid-October Jim needs to be concentrating on hill work and/or tapering for Mountain Masochist, so he doesn't plan to run the flat NRT race. He told RD Annette Bednosky that he's available to captain or assist at one of the aid stations if she needs him. She was very happy with his offer to help. It'll be a piece of cake for him compared to captaining the Cunningham aid station at Hardrock the last two years. 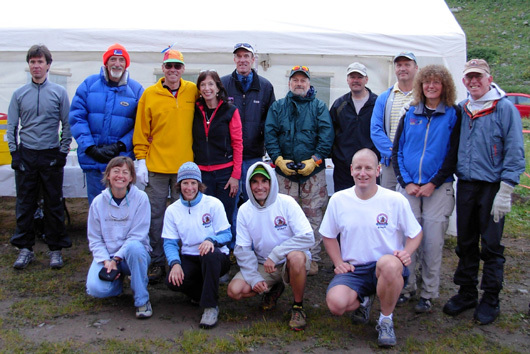 Stellar 2007 Cunningham aid station crew at Hardrock. Jim and I are on the right. As mentioned above, our goal race this year is Across the Years at the end of December. We had such a great time out there at New Years, and it's such a perfect venue for me, that we plan to drive to Arizona for the race regardless of the cost of fuel in another six months. Entry for the race will begin this month and runners will probably be selected in July or August. The selection process may differ some from last year; we won't know for certain until the ATY web site is updated. If one or both of us gets into ATY we may go out early enough to run the Sunmart 50K/50M in Huntsville State Park, Texas as our last long training run. It's "on the way" and on the same trails we ran in February. So that's our fairly simple race plan for the next six months. Jim may do a few more short local races as speed work, but I probably won't unless I can first determine how hilly they are. The three I ran recently were too hilly for the training I've been doing. Jim plans to run more miles at Hinson Lake than he did last year, and then run Mountain Masochist four or five weeks later. His training challenge is greater than last year because he's done fewer training miles this year so far, and he probably won't have two runs of 50 miles or longer like he did last summer when he DNFd the Bighorn and Grand Teton 100-milers. His first goal is to gradually increase his distance. I mentioned in the last entry that he's been preoccupied for several months with his EMT classes. 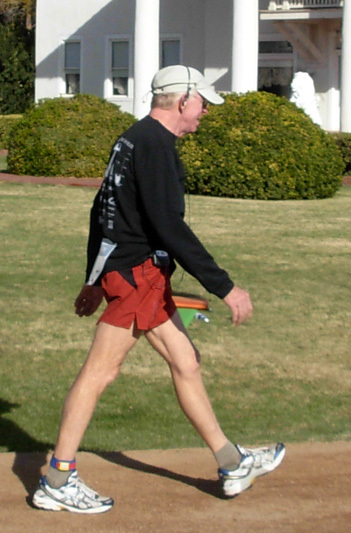 After today's 4-hour final exam, he can begin to concentrate more on his running. It's been about two months since his last really long run at the Promise Land 50K, which is actually about 34 miles. He doesn't need to start from scratch, but I don't think he'll go out this weekend and run that distance quite yet; he'll work back up to it. Last year Jim entered Masochist but did not run the race. Instead he offered to "sweep" the last half of the course. This year he intends to run more miles at Hinson Lake at the end of September, then do all 53-54 miles of Masochist a month later. He should then have time to recover and build on that excellent base for ATY. Jim still has the same training challenge he faced last year: Hinson Lake is relatively flat and Mountain Masochist is, well, mountainous. So he's got to train his body for both types of terrain at the same time, incorporating hills, speed work, and distance in just the right ratio to benefit him on both courses. That's not easy. He needs to run enough flat miles to train his muscles for the repetitive motion at Hinson Lake while running enough long hills to train them for the punishing, long hills up and down at Mountain Masochist! If he errs on the side of "too much hill work" he'll be in better shape for both races than if he runs too many flat miles. The hills should give him extra strength for Hinson Lake. But not doing adequate hill work will definitely hurt him for Masochist. Then there's speed. We always need to work on that because we seem to lose speed faster than we lose strength for hills and endurance for distance. He'll do some more short races this summer as well as one speed workout per week. Even though Jim's and my weekly mileage is about the same right now (average 25 miles/week), I feel like I'm "behind" him in more ways than just the pace we run. The longest runs I've done in the five months since ATY are a few 15-milers and it's been almost two months since I did the last one. I've been running every other day and walking a couple miles on non-running days. I haven't been doing as many "easy" runs as I used to. Since I have to limit the stress on my knees, my shorter runs (4-7 miles) have focused on "quality" -- either speed or uphill strength work. Not only do I need to increase my weekly mileage gradually, I also need to build up my long runs gradually through the summer so I can run 50 miles comfortably at Hinson Lake in late September. I'm glad I'll have a longer base-building period for ATY this time -- six months will be just about right. Last year I hurt one of my knees in mid-August doing too-steep running and hiking on 14ers in Colorado. I barely ran the seven weeks before Hinson Lake. An MRI right before the race confirmed no damaged tendons or ligaments, which was good news, but the bad news was a diagnosis of minimal cartilage left in both knees. My orthopedist gave me the OK to begin training again and call him back in the future when I start having pain. I celebrated by running and walking 39 miles at Hinson Lake! That was more than I should have done on so little training but my knees didn't hurt. The long "rest" period probably helped in the long run, so to speak, but it was almost like starting to train all over again in the three months leading up to ATY. 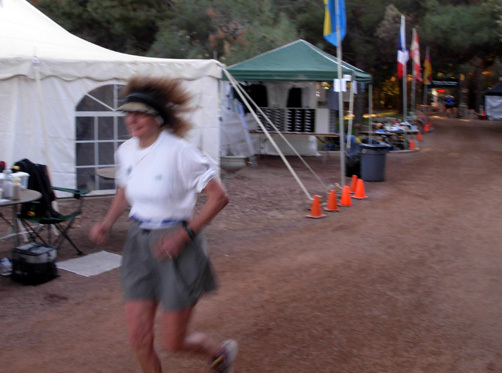 Sue running late in the morning during the 2007 ATY 24-hour race. Photo by Nick Coury. Hopefully, this year I won't have any injuries to set me back and my Granny Knees will hold out a little longer through judicious training -- no junk miles, just quality ones. I plan to use a beefed-up version of last year's training plan for ATY, spread out over six months instead of just three. probably run the Sunmart 50K (not the 50-miler) three weeks before ATY as a last long training run; I want to be well-rested for ATY. Sue running late in the afternoon at the 2007 ATY 24-hour race. Photo by Jim. Even though 2008 hasn't shaped up to what we expected when I wrote the introductory journal entries in January, we are adapting our running and travel goals to our current reality: other interests and obligations that have taken priority since then, and a rather abrupt economic recession that has us practically hoarding our money in case things get even worse. This has been a weird and depressing spring, with energy prices through the roof, world-wide food shortages and high prices, the housing bust, a weak dollar, falling stock values, natural disasters and freak storms here and abroad, a war on terrorism that has no apparent end in sight, and a never-ending barrage of rhetoric from both major U.S. political parties. Jim and I do our best to deal as calmly as possible with all the stressors, and one of the most effective coping mechanisms for us is to be physically active. We aren't "running away from" anything; we are trying to maintain our mental and physical health so we can cope even better with all the monkey wrenches life throws our way. We highly recommend more physical exercise if you're getting stressed out. Next entry: more physical activities we enjoy -- "cross-training"